Rajna Vajra. 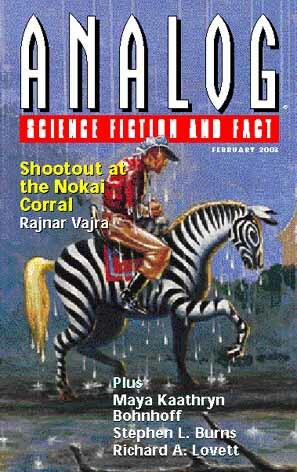 Shootout at the Nokai Corral. Stephen L. Burns. Capture Radius. A young woman in her father’s space-vessel in Earth orbit is clearing up space-junk, a potentially lucrative business. However, when the Russian mafia hijack a nearby vessel, she has to play for higher stakes. I would recommend Burns touts the story round for film rights as the glamorous American heroine and Russian mafiasos would make a Hollywood SF film on a par with others in recent years. Brian Plante. Lavender in Love. An unlikely love story – a vending machine AI and a young girl from the wrong side of the tracks who has got into particularly bad company. A more down-to-Earth nod in the direction of ‘The Ship That Sang’ – which Plante acknowledges in the final sentence. A far future, post-human entity is wheeling through the cosmos, its mind harkening back many many millenia to its Earthbound existence. Another shorter short story, and quite effective in its own way. A tongue-in-cheek First contact story. Scientists are bemused by the message coming from space. What can it mean and who sent it? 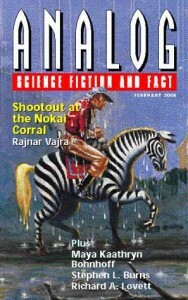 The lengthy Vajra novel serialisation leaves little space for the remaining short SF. Those stories are quite reasonable in as far as they go, with the Plante being my particular pick.